For the convenience of railway modellers. Individual Data Sheets, as supplied with each product, can be accessed by clicking the 'Data' links in the table below. The Australian Prices include GST. The official Export Prices are in Australian Dollars (AUD), but for your convenience an approximate equivalent value is shown in four other currencies. For an exact conversion to any world currency, please click this link to open a Currency Converter. Light Emitting Diodes - LEDs - use as panel indicators or for making colour light signal heads. 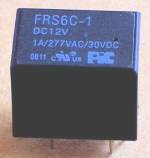 All are provided with a current-limiting resistor for 12V operation. Diodes - general purpose small-signal and rectifier diodes. Switches - for panel switching and frog polarity. Terminal Blocks - 12-way 5A screw-type. Use for organised electrical connections. 3.2mm diameter - clear. Length 1.2-metre. 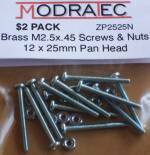 Screws and Nuts - general purpose solid brass or zinc-plated (zp) steel. Brass M3x20mm Pan Head - $2 Pack. Contains 5 screws and 5 hex nuts. Thread is M3x0.5; head slot; nut 5.5mm. Brass M3x8mm Pan Head - $2 Pack. Contains 6 screws and 6 hex nuts. Thread is M3x0.5; head slot; nut 5.5mm. Zinc-plated M2.5x25mm Pan Head - $2 Pack. Contains 12 screws and 12 hex nuts. Thread is M2.5x0.45; head pozi/phillips; nut 5mm. Zinc-plated M2.5x8mm Pan Head - $2 Pack. Contains 16 screws and 16 hex nuts. Thread is M2.5x0.45; head pozi/phillips; nut 5mm.